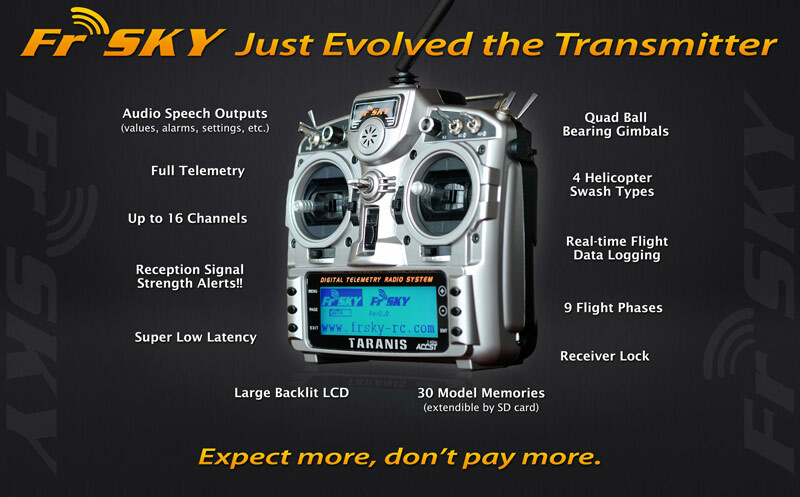 FrSky "FreeSky" new Taranis radio system with telemetry and SD card memory as released at the Toledo RC show. All Taranis transmitters are updated to the latest release version of OpenTX firmway. Expected to retail at aproxmitly $250.00 and we are already stocking all the telemetry sensors and receivers. Hobby and model construction supplies. Integrates with CompanionTX - a FREE computer program that is a transmitter setup buddy. CompanionTX (Windows/Mac/Linux) is used to set-up models with the wizard, save, edit and share your models and settings as well as simulate your transmitter or model setup. Open source community-driven firmware, so unlike with major manufacturers if you need a special function or have good improvement suggestions just raise your voice, and don't be surprised if it's implemented a couple of days later! Visit http://www.openrcforums.com to meet the developers!